“I’ve learnt French in school, but I can’t speak it”. How many times have you said that, or heard someone say it? Rendez-vous français offers classes with a maximum of 8 students in each class. This means that you will get plenty of opportunities to speak French, practise it and improve your oral skills with the other students and with the teacher. Interaction in the classroom is essential, and makes the learning process more motivating and efficient. We will use various material supports in order to make each class unique and enjoyable: film extracts, songs, games… Our classes can be hard work, but always fun! Caroline wrote her thesis about the place of mother-tongue in French classes, and how benefiting or disadvantaging it can be for the students. Our teachers teach classes using French as much as possible, which will allow you to come and learn in a language immersion environment. Don’t worry, it may seem scary, but we have experience in teaching complete beginners in French only, and you will progress much quicker! However we will not hesitate using English if needed, mostly when it comes to linguistic explanations, and to build bridges between English and French, when it makes it easier for you. Our objective is that you won’t be saying “I’ve learnt French in school, but I can’t speak it” anymore! We want our students to be able to communicate in French as quickly as possible. Our teaching method is task-orientated, which means that each class will allow you to learn a new task (how to introduce yourself, how to ask for directions, how to order in a restaurant, how to debate in French…). With this pragmatic and communicative objective in mind, we will integrate both linguistic and cultural skills. Would you like to add a worldwide recognised French diploma to your CV? Whether it is for your career or a personal motivation, we can help you. Caroline is a certified DELF examiner, and will be able to help you get ready for the exam, that you can sit in Dublin, usually in November, January or May. The last student we helped with their A1 DELF exam got an exceptional mark of 96%!! 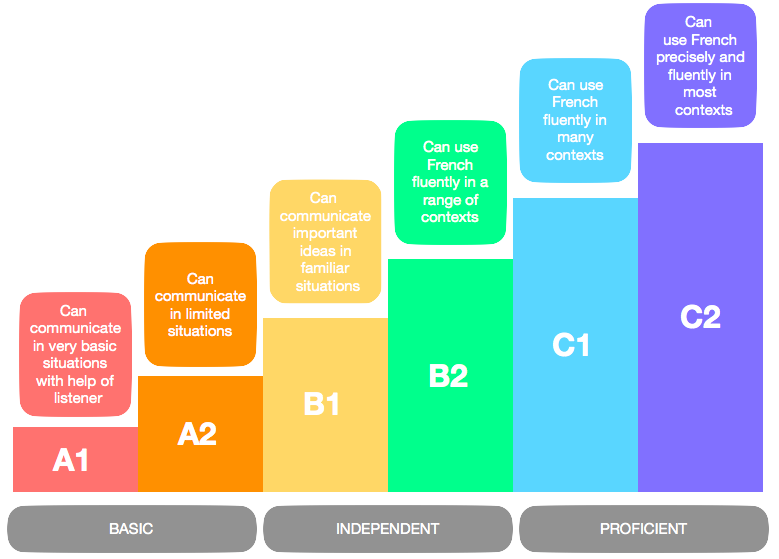 Our classes follow the Common European Framework of Reference for Languages. Sign up for the latest news ! As we are in class most of the day, the best and quickest way to reach us is by email or text.